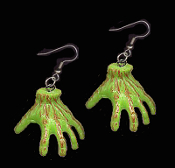 Huge Slime Green Bloody Walkers ZOMBIE HAND EARRINGS - Halloween Frankenstein Monster Ghoul Hands - Spooky Gothic Living Undead Walking Dead Inspired Charm Costume Jewelry for any THING Collector! Colorful Plastic, dimensional, detailed fingers. Scary, Creepy, Crawling, Severed Body Parts. Great to wear to a Haunted House cemetery graveyard haunt! Approx. 1.5-inch (3.75cm) Diameter.